The "longbi" is actually a round peripheral disc with dragons on it. It is the traditional remedy used by old style feng shui masters to cure misfortunes due to the heavy punishment from the confrontation with the Tai Sui. When one touches the longbi, it will ease your efforts in having a full grip and control over your fortune and luck. It has the ability to transform negative chi into positive, overcome obstacles, prevent annual dangers caused to zodiacs, subdue bad luck, combat bodily harm and terminate stress. Rub it with your hand to create beneficial outcome especially when going through hard times, making hard decisions or even interviewing for a job you desire. There are six emperor coins hidden under the stand to create luck from the heaven, so one will be assisted by heaven energies to overcome a turbulent year ahead. The dragon has an imperial and unsurpassed status. The chinese emperors called themselves the dragons which shows how diving and prestigious they were being considered. The Dragon brings upon the essence of life, in the form of its celestial breath, known to many as sheng chi. He has the ability to blow out cosmic "chi" from his breath, which is the base for studies of Feng Shui. Hidden in the caverns of mountains that are beyond reach or resting in deep seas, the dragon is able to transform and render itself visible or invisible to people. Some said the mountains, valleys, rivers, buildings and highways are all correlated to Dragon head, claws, tail, veins and his pearl, which translates to fundamental studies of feng shui. Besides drawing in water, the dragon also has the power to release water as it is the king of ocean. That is why ancient emperors used to pray to Dragon God in times of draught or for less rain in times of flood. He yields energy and generate power in the form of the seasons, bringing water from rain, warmth from the sunshine, wind from the seas and soil from the earth. In other words, it is said that the Dragon is the ultimate representation of the forces of Mother Nature. The greatest divine force on Earth. Being the "yang" mythical animal, the dragon can scare off wandering evil spirits, protect the innocent, bless one with safety and increases wealth to all that hold his emblem. The chinese dragon is look upon as the ultimate symbol of extremely good fortune. Today, all Feng Shui masters treat the dragon with great respect and have symbols of the dragon as their ultimate possession. You may display the longbi in your personal zodiac direction or at your work desk to overcome tai sui confrontational punishment. 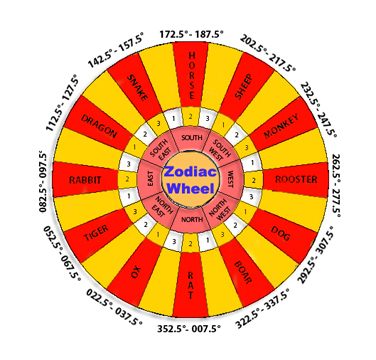 Astrology Wheel: Each zodiac is associated to one subdirection.